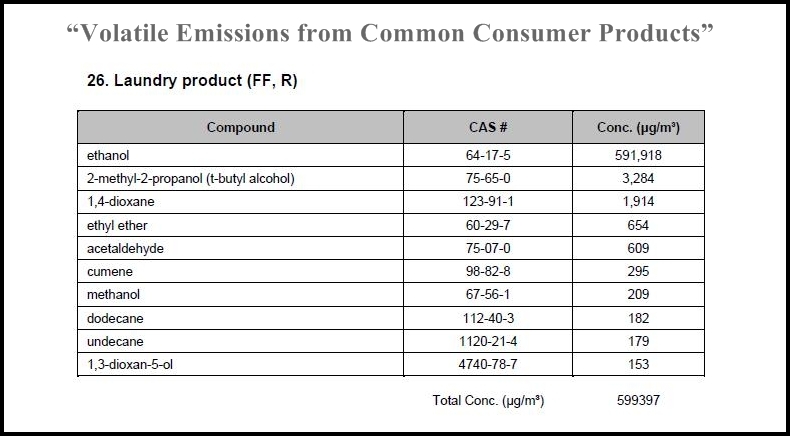 18.6 % respiratory problems; 16.2 % mucosal symptoms; 15.7 % migraine headaches; 10.6 % skin problems; 8.0 % asthma attacks; 7.2 % neurological problems; 5.8 % cognitive problems; 5.5 % gastrointestinal problems; 4.4 % cardiovascular problems; 4.0 % immune system problems; 3.8 % musculoskeletal problems; and 1.7 % other. Warning: product contains calming vibes, pleasant fragrance, and carcinogens. Chemical Sensitivities, MCS/ES, Fibromyalgia, ETC. New videos with Dr. John Molot from Action CIND. Campaign for fragrance-free health care in the U.S.
Perhaps “sensitivity” to perfume isn’t abnormal, after all, but a gift of common sense. “Stink!” – the movie the Chemical Industry doesn’t want you to see. Be fragrance-free! It’s good for you, it’s good for me! 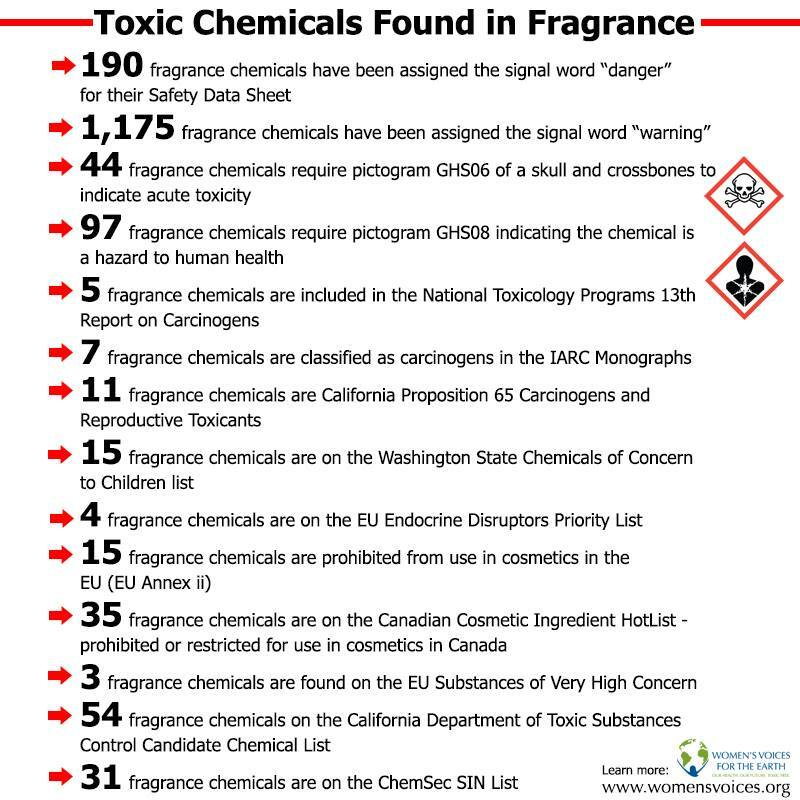 Conventional fragrance-free products can still be made with toxic and hazardous chemicals! 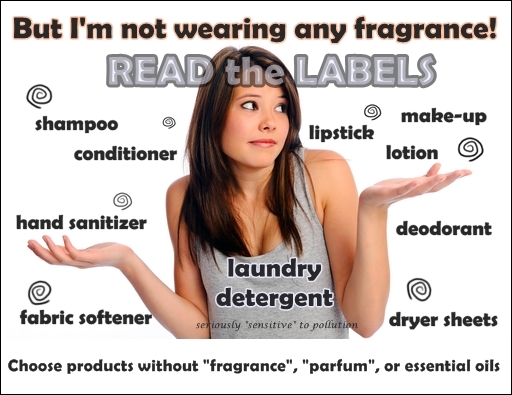 It’s not enough to just be fragrance-free! We must be non-toxic too! Together we can stop this insanity! There are already GMO-free, gluten-free, nut-free, pesticide-free, smoke-free, and other -free basics available due to health requirements. Our long term survival depends on access to fragrance-free life supports too. Also, support the NGOs who push for better disclosure and health protective regulations. Support the efforts to give us the right to a healthy environment. This entry was posted in Air Quality, Brain, Chemicals, Child Health, Disability, Environmental Health, Fragrance, Human Rights, Pollution, Public Health and tagged allergies, asthma, autism, cancer, chemical sensitivity, environmental sensitivities, essential oils, fibromyalgia, fossil fuels, hazardous air pollutants, IAQ, invisible disabilities, MCAS, MCS, MCS/ES, multiple chemical sensitivities, petrochemicals, pharmaceuticals, profits, scented products, STINK, supply chain, toxic trespass. Bookmark the permalink. Thank you so very much for this post. This must have taken an enormous amount of work to put together!! It’s a timely post for me because I have been trying to get accommodation at work for MCS without much luck. I work for the Canadian government and have filed grievances and Human Rights complaints that are still not resolved after over three years – all the while I am repeatedly injured and assaulted by use of scented products by my coworkers who know better. I’m very greatful for the work you do!! I wish I had something good to say about that Jo-An! I do wish you ultimate success, which would benefit all your co-workers too, as it would remove so many toxic exposures from their lives as well. About the work involved… I never know if or when something will come together, when my brain will function enough to connect things in a useful way. I started this post a few months ago (the images inspired it) and then ended up too brain dead from exposures I had no control over (but other people could have) to do anything about it until recently. I try to save all the good links I run across, and if I can’t think up words to say anything about them, or find the right links (because my bookmarks and folders are a mess) I can sometimes come up with an image, or just copy and paste a few things! And then it’s more like assembling puzzle pieces, re-arranging them until they kind of fit. I have really had to learn to accept “good enough” under the circumstances I deal with here. I am just not capable of doing things the way I would like to do them. If I had the energy, I’d make bite size posts with all these categories separated… but I think that will happen with images on fb, not here. 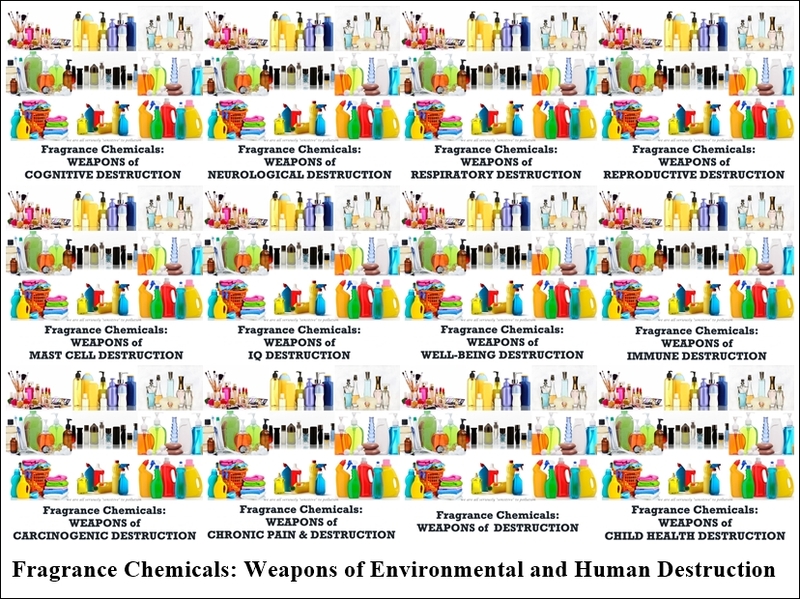 May the people of the world wake up to how we are all being poisoned for profit by the industries who subject us to toxic chemicals in everyday products and materials, so that we can stop this before it’s too late for everyone! Women of reproductive age could be exposing themselves to harm by working on retail cosmetics and perfume counters. Researchers found higher levels of phthalates in these workers in Taiwan and warn that this can pose health risks, particularly for pregnant women. ‘We suggest indoor air quality of phthalates should be re-evaluated, and reproductive-age women should work in other departments to reduce the risk, especially for those pregnant workers,’ says Huang. Woodruff suggests reformulation of cosmetics would be a better approach.